Enemy is the latest thriller from Canadian director Denis Villeneuve, and it stands as a hybrid mix of David Lynch and David Fincher at their very finest. 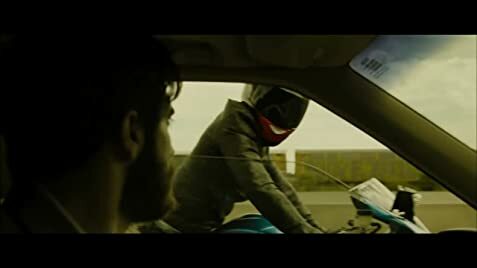 Enemy follows Adam (Jake Gyllenhaal) on a journey to find his exact lookalike named Anthony, a terrible D-list celebrity. As his investigation deepens, the mystery thickens and he is thrown into a fray way above his head. What works in Enemy is Gyllenhaal's fearless performance as a man who is searching to find who he really is. There are a couple scenes that he has where is truly riveting and it becomes so hard to take your eyes off the screen. It really is an explosive yet very contained performance that I feel needs a lot of recognition. Enemy marks itself as a film about identity and never knowing who you truly are and the pressures of wanting to become something you're not. While it remains as a heavy message, it still makes for a film that almost demands repeat viewings. At 90 minutes even, the film moves and never slows down enough for us to even breathe. Before we can even question what is going on in one scene, Villeneuve throws us another curve ball to contend with. While that may bring confusion to many people, it is very welcoming to a viewer in the mood to do some serious thinking. Anything beyond that, it may garner some negative responses especially if you're not paying close attention. Enemy works well as a psychological thriller, bringing some of the most disturbing images I've seen on screen in recent years. This film is NOT scary, but it is extremely uneasy and very creepy, especially towards the last twenty minutes of the film, which had me holding my breath as we finally discover the truth of what is going on. Overall, this is one hell of a film that really does almost require a second (and possibly a third) viewing. I highly recommend it, especially to fans of David Lynch's Eraserhead. The images are memorable, the performances are very well rounded and this is just a very very well done film. For the scenes in which Adam and Anthony are in the same room, Villeneuve used a tennis ball on a stick as a point of reference so Gyllenhaal would know what to look at. Mother: Hello, darling, it's your mother. Thank you for showing me your new apartment. I'm worried about you. I mean, how can you live like that? Anyway, would you call me back? Let's get together again. I love you. (at around 5 mins) During his lecture, professor Bell is standing in front of a blackboard filled with concepts and philosophers' names. The name of German philosopher Fichte is misspelled as "Fitche".